In the Wonderstone Mines at Ottosdal (West Transvaal, South Africa), hundreds of metallic spheres have been found over several decades in pyrophillite (or wonderstone) deposits of Precambrian date, some 2.8 billion years old. Pyrophillite is a metamorphosed sedimentary mineral mined for use in masonry buildings, as an absorbent, as a filler, as an ingredient in industrial compounds and for a variety of other uses. Two types of sphere are alleged to have been found in the pyrophillite; one is a bluish metal with white inclusions, while the other has a metallic coating around a spongy material. Only examples of the second type seem to have been examined by geologists, who have found that they consist of pyrites and goethite. At least one of these spheres has three parallel fine grooves running around its centre. Lab technicians were said to be at a loss to explain how they could have been formed by any known natural process. The first report citing these spheres has been traced to The Weekly World News, 27 July 1982. This is a publication similar to the British Daily Sport or the American National Inquirer, neither of which is noted for the quality of its investigative journalism. The spheres are much softer than has been claimed, but at least some of the goethite nodules have a parallel groove, although only one has ever been identified with three such grooves. However, there is a serious objection to regarding them as artefactual, since they formed in a metamorphic deposit and could not have existed before the metamorphosis of the deposit took place. 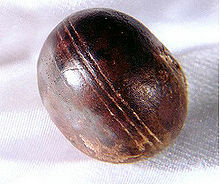 If the grooves are artificial, they can only have been carved after the sphere was removed from the pyrophillite. In other words, the spheres are natural, although a question hangs over the grooves, which are either natural and immensely old, or artificial and modern. You can find more dismantlings of the claims here, by Tim McGuinness and here, by Paul V Heinrich. You should contact Exeter University Archaeology department. One of my friends is doing a docoiral thesis on the stone carved balls from Scotland. We did an undergraduate archaeology degree. He kept up the good work but alas I went on to work in IT! The Scottish stones are just sling stones that have in many cases been personalized so that people can reclaim them or know whose stone took down the prey animal. Humans are not dumb and have known of slings for as long as we have been using animal skins and ligaments. I think it’s quite clear that either Cthulhu or Satan manufactured these. Nobody else has taken credit, and they’re the only two guys around that are that old. Q.E.D., really.